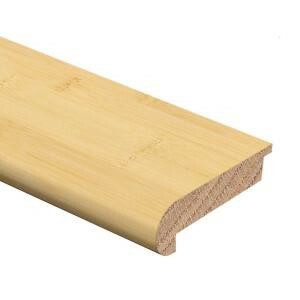 Horizontal Bamboo Natural Stair Nosing is designed for installation on the edge of stair tread. Stair nosing adds beauty to your home while absorbing much of the staircase traffic. Coordinates with hardwood flooring, trim and moldings the stair nosing provides beautiful finished look to your home. Buy online Zamma Horizontal Bamboo Natural 5/8 in. Thick x 2-3/4 in. Wide x 94 in. Length Hardwood Stair Nose Molding 014582082594, leave review and share Your friends.